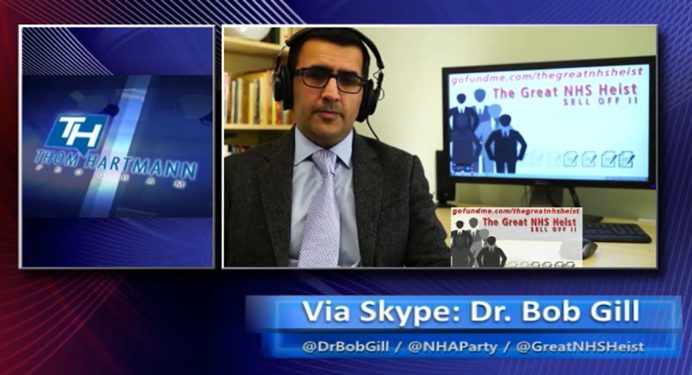 Thom speaks with Dr. Bob Gill, family physician and filmmaker, about his new movie, “The Great NHS Heist” and the push by American insurance companies to privatize the U.K.’s National Health System. What exists now in the United States of America is is an underclass of people who are not able to access adequate medical health care despite in many cases paying for health insurance. The insurance model in America being profit based is like any business, always looking for growth and always looking for improved profit margins. This is a model that engages in brinkmanship with peoples health and lives. Overcomplicated administration riddled with gotchas and deductibles. Insurance companies will argue the efficacy of a treatment until you die. If it means not paying out. One of the biggest operators in the market is United Health Care. The ex head of United Health Care, Simon Stevens is now head of NHS England. In the UK we have had an explosion in people not being able to afford to eat. With a failing and flawed social security system, not acting as a social safety net any more. Charity based Food banks have flourished in order to help hungry families. We are looking at the same for health care. Imagine lining up in you local school car park in order to get your childrens teeth checked, or your babies asthma? This is already happening in America and organisations are springing up across the USA in much the same way as food banks have in the UK to fill an unmet need. Since 2012 the UK government no longer has a duty of care for health provision. Opening the doors to an American model. This is not a fight to stop the privatisation of the NHS this is a fight to claw back our NHS which is already packaged and ready for offering at the profit alter of the FTSE and Dow Jones gods. Watch the video to hear the experience of one American mother trying to look after her children’s health. 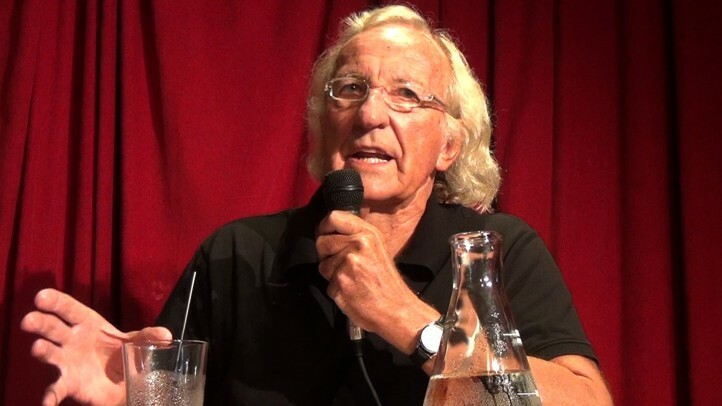 Message of support for The Great NHS Heist from John Pilger. Once judged as the finest, most cost efficient health service in the world, the NHS is now in mortal danger – due to ruthless government privatisation plans. Are the British people fully aware of this? Or have they been sidetracked by the propaganda of so-called austerity. A group of doctors and health care professionals are dedicated to getting the truth out. Please support this film. It was a great pleasure to meet with Professor Whyte. In his book “How Corrupt is Britain?” he explains how the structure of public services and the NHS have been re-shaped to enable privatisation. Managerialism, New Public Management, has instilled a target and performance management culture replacing public service ethos, crowding out and silencing traditional leadership provided by those with relevant experience. Not only has significant funding and effort been diverted away from the delivery of the patient care but perverse incentives have corrupted institutions. We have seen how NHS hospitals manipulate waiting lists to meet targets and how financial penalties and rewards drive activity for a market in healthcare. British corruption does not take the form of cash changing hands in brown paper bags but in the blurring of the public and private sphere and the creation of the revolving door between the two. 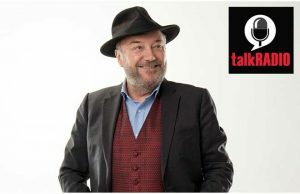 Policies developed by Neoliberal think tanks to promote privatisation used to persuade politicians via the lobbying industry to drive more business to private companies through outsourcing of contracts, use of Private Finance Initiative and oiling the wheels, the big 4 accountancy firms. Yet contrary to the image portrayed in the media, according to research by Liverpool University, the public want an end to this institutional corruption caused by revolving door and lobbying and a return to politicians serving the public interest without the conflicts of interest created by corporate money and influence. 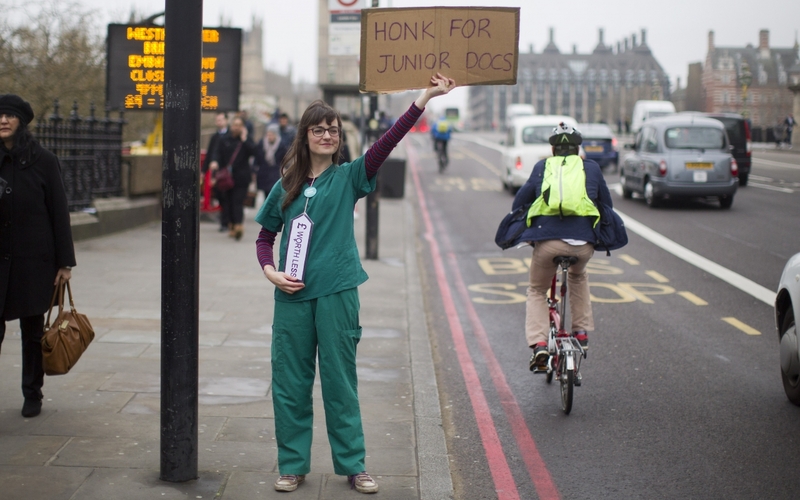 After suspended strikes and media backlash, what next for the junior doctors? A junior doctor looks ahead at what will happen in the struggle for fairer contracts, and says the fight is far from over. 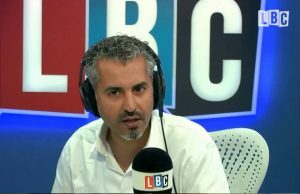 Dr Bob Gill speaking on LBC Radio to Maajid Nawaz 03-09-2016 About NHS Budgets. Today We signed up to gofundme.com/thegreatnhsheist No matter how much time and good will we have. To make a film costs money, to make a good film costs more money. We think with our team we can achieve our goal to make a film that would normally cost much more to produce by giving our time and skills. So we are asking for £60,000!? Yup! We sure are… and as quickly as we can, please! We need your help to get this done!. Then get this film spread far and wide. As quickly as possible. We decided we where going to make a film. 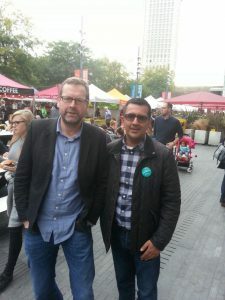 A kind of “sell Off 2” an update on the NHS situation and a wake up call to all. What ever we raise. How much does a Documentary film cost?. This is a how long is a piece of string question… A piece of string that has got ever longer in the age of high definition mobile phone cameras. The answer is from the cost of a high end mobile phone to millions of dollars for an hour of finished program material. The average for an hours finished broadcast television is $500KAUS for single non serial type film. So really £60,000. isnt that much, How are we going to do it? In a number of ways. We could of hired equipment but that makes production very inflexible, If peoples plans change and rescheduling has to be done that can get expensive. So in order to fix our costs we are buying our main camera. One of the go-to documentary cameras currently is the Sony FS7. With extras, some of which you would have to buy whatever the camera, and storage media. It can add up quickly. In the end our choice is to go for a Sony A7S2 with a Sony Video lens. Its more compact good in low light and thousands cheaper. We will use a separate Atomos Flame series recording device and monitor. This will give us Better monitoring, extended recording times arguably a slightly improved colour space and cheaper recording per G/B. a 480 Gigabyte solid state drive is around £100 – £0.20 per gig. A 64 Gigabyte fast SD memory card is around £35 – £1.82 per Gigabyte. We have our own editing capacity this cuts one of the big costs of film production. We are doing it on our own time. We aren’t having to pay a film crew to make this film. So big saving there, And much appreciation to those donating time and effort for this project. We are mostly not using commercial promotion of The great NHS Heist. We are using our networks social media and novel methods to promote the film. Planning this film has had to be done with an assumption of moving goal posts. Reaching our fund goals would mean that we will be able to travel to interview people we might not other wise be able to include. Since We are headed for an American model, & with corporate American players already entrenched in the UK’s health system. We need to speak to our cousins across the pond and report directly on what its really like for the average person in the american system. For locations we are all ears interesting spots are hard to come by. This is another production cost we are trying to avoid. The process of making this film takes months in this time the will be incidental costs. Office type expenses, coffees, web domains, light bulbs, set decorations sticky tape.. you get the idea. We need to have some funds for the little things that can cause big delays if not adequately funded. The are two other things which are large budget expenses, We will do when fully funded. A soundscape and or colour grading (processing). Calling any top graders out there wanting to do their bit to help try and save the NHS get in touch 😉 S-Log3 and charted. Whilst we are avoiding commercial promotion of The great NHS Heist. The will be costs associated with promotion. Flyers, screenings, etc. Making the choice of how to raise funds for this project was a tough one. Crowdfunder, Paypal button, Gofundme? For the time being we have gone with a Gofundme page and a paypal button. the Paypal option attracts less charges. What ever platform you favour please support our project if you can, thanks :). Max & Stacy – A visit to see Mr keiser and Ms Herbert. 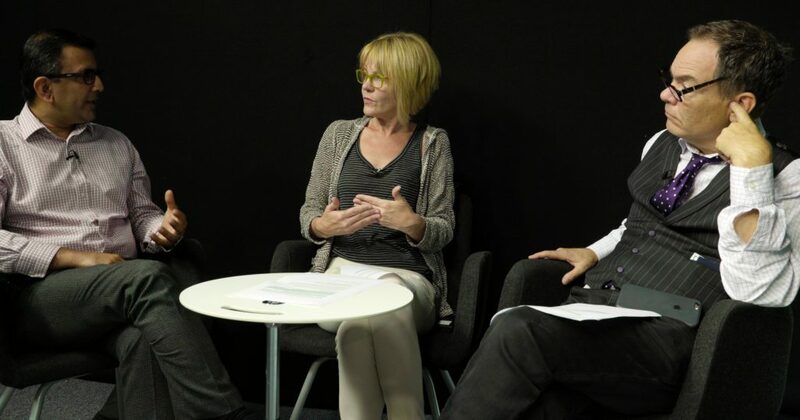 Earlier this week Dr Bob @drbobgill got speak to Max Keiser @maxkeiser and Stacy Herbert @stacyherbert For “Double Down” Their podcast for Sputnik . 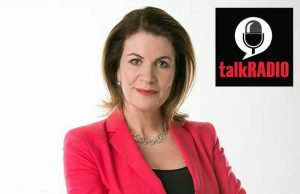 About the not so National Health Service, and PFI’s Gobbling up the funds of hospital Trusts, and our documentary The Great NHS Heist. Short video of highlights will be available shortly. Will keep you posted. 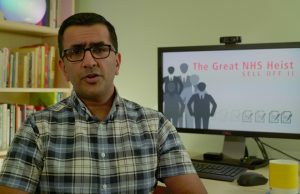 Copyright © 2019 The Great NHS Heist Documentary.